In the world of energy efficiency, market segmentation and other methods of generalization are used to design programs and marketing. While every home is different, just as each person is different, energy efficiency programs often operate with limited marketing budgets and staff allocations. Within these limitations, how best can program administrators focus limited marketing resources toward homes with high energy use and likely participants? One emerging option is to design outreach efforts at the neighborhood level using localized data on buildings and demographics. 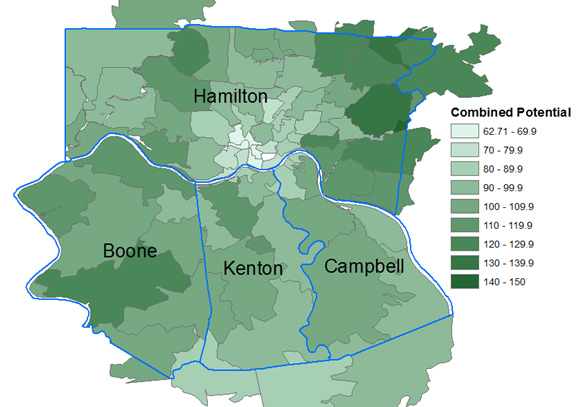 ACEEE’s recent market study of four core counties within the Cincinnati region (undertaken with the University of Cincinnati Economics Center and the Greater Cincinnati Energy Alliance) looks at questions of neighborhood targeting using analysis of ZIP code level data. In addition, a core analysis focused on the potential impact of residential and nonprofit building retrofit programs over 20 years. These studies showed that while energy savings potential for the region is large, savings potential and potential participation in energy efficiency improvement programs are not equally distributed geographically or demographically—rather a number of factors influence both the energy and human pieces of the puzzle. For our analysis, we first looked at building stock data for each ZIP code in the four-county region in order to characterize the “supply” of energy efficiency potential. We used data on primary heating fuel from the U.S. Census and the distribution of home sizes from the auditor or property valuation administration in each county. We then applied the ZIP code-specific variables to estimate the distribution of several dozen types of homes typical to the region that we had identified. Shown below are the average percent energy savings in each ZIP code from a “comprehensive” home energy retrofit (consisting of efficient heating and cooling improvements, attic insulation, duct sealing, and infiltration reductions). The lightest shade of red represents a savings of 22.5% or less and the darkest red is a savings of 27.5% or greater. For reference, the City of Cincinnati is located in south central Hamilton County, Ohio and the three counties across the river are in northern Kentucky. The limited amount of applicable building data available at this scale plus the difficulty of obtaining it due to its being housed in multiple local sources was one challenge we encountered. Next we turned to the demand side. To estimate which neighborhoods had large numbers of households likely to participate in energy efficiency programs we looked at demographics. To determine specific variables we referred to Driving Demand for Home Energy Improvements, which summarizes demographic variables commonly associated with higher rates of program participation. In the end we included five variables for our analysis: homeownership, education, and three variations on age and income data. Based on these variables we constructed a participation potential index with scores above 100 representing above average participation potential and those below 100 representing below average potential. In the map below, the ZIP codes closest to the red end of the index had the highest calculated potential and those on the blue end had the lowest. In general, this analysis shows higher participation potential outside of the historic core of the region, but not all potentially important variables were included in this analysis (for example, age of buildings has been shown to increase likelihood of participation but was not included). Finally, we combined these two analyses to build a “combined potential” index. Similar to the participation index, the average regional potential is represented by a score of 100; higher scores (darker greens) are greater combined energy saving and participation potential and lower scores (lighter greens) are lower potential. Of course, even an excellent demographic analysis is no substitute for on-the-ground experience. Results from a summer neighborhood canvass run by the Greater Cincinnati Energy Alliance (the canvass outreach plan was partially based on the analysis above) found higher levels of interest in home energy assessments in neighborhoods that were more walkable, had a large number of older and historic buildings, or had a progressive political orientation. There was less interest noted in relatively new, auto-dependent, middle- or upper-income suburban communities, often the very places with the best combined potential scores on paper. This suggests that neighborhood type, individual relationships with the surrounding community, and owners’ perceptions of their homes may play a larger role than considered in our analysis or noted in studies to date. Also, it may be too soon to tell if high levels of interest in energy assessments will translate into high participation in making energy improvements in the region. Even after years of utility marketing experience with efficiency programs, targeted community and geographic outreach is still a relatively new practice. 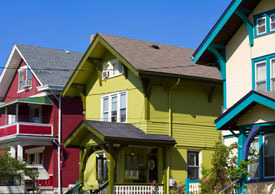 Over the past few years, the U.S. Department of Energy’s Better Buildings Neighborhood Program and local partner organizations have helped to test several outreach innovations in communities around the country, including Cincinnati. Thanks to these efforts and others, there are likely many more insights to come from both research and local practice on how best to target and design programs for greater participation and energy savings.